The public dissemination of sporting news imagery has ridden a meteoric path over the last two and a half centuries. Today we can follow not only live action broadcasts, but also turn back the hands of time to study – captured in glacial progression – re-runs of key moments of the contest, or catch the frozen instant in a clear close-up photograph. It has not always been so. In the earliest rowing news, Doggett’s Coat and Badge contests were publicized from their beginning in the early 18th century, usually with a couple of lines in one of the daily or weekly sheets of the time, but no illustrations would be found in these text-only issues. 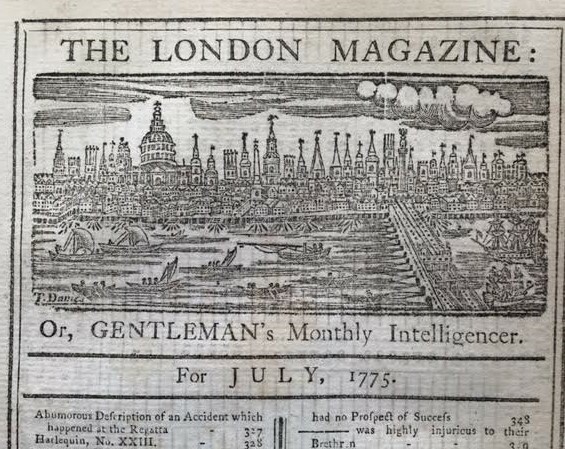 The first image of a rowing contest to be published in the news media of which I am aware appeared in the July 1775 edition of The London Magazine – or Gentlemen’s Monthly Intelligencer, a publication that represented Whig views in opposition to the Tory’s Gentlemen’s Magazine (and incorporated into its masthead vignette scenes of the rowing that was then prevalent on the Thames). 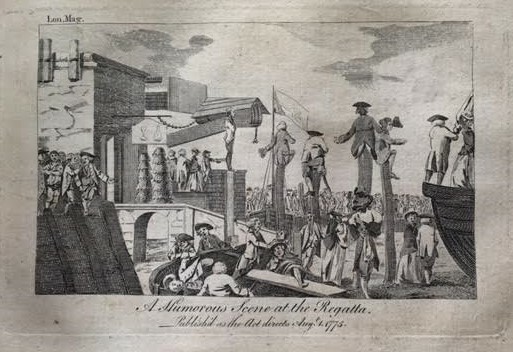 Captioned “A Humorous Scene at the Regatta”, this frontispiece copper plate engraving by “J.W.” was accompanied by two rowing-related articles – “A Humorous Description of an Accident which happened at the Regatta” and “On the Regatta”. 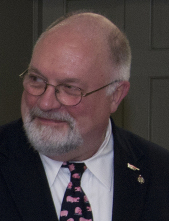 The image tellingly shows nothing of the race itself, but caricatures the spectator crush at the Doggett’s Coat and Badge event (the theme of the crowd in attendance being as or more interesting or newsworthy than the contest – and certainly easier for the land-bound artist to capture – has informed much popular rowing imagery ever since). 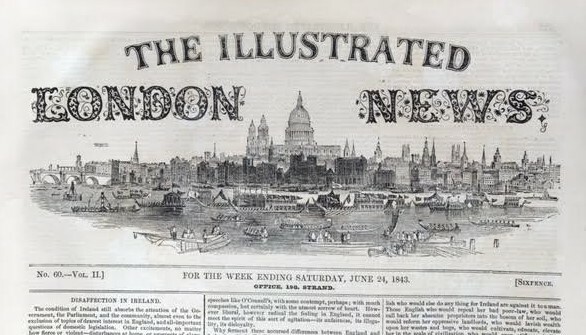 The appearance of The Illustrated London News in 1842 spawned a number of “illustrated” daily and weekly newspapers which were lavishly sprinkled with wood engravings. Rowing remained so deeply embedded in the national consciousness that, as with its predecessor publication 70 years earlier, references to oared London river traffic were also embedded in the paper’s masthead. 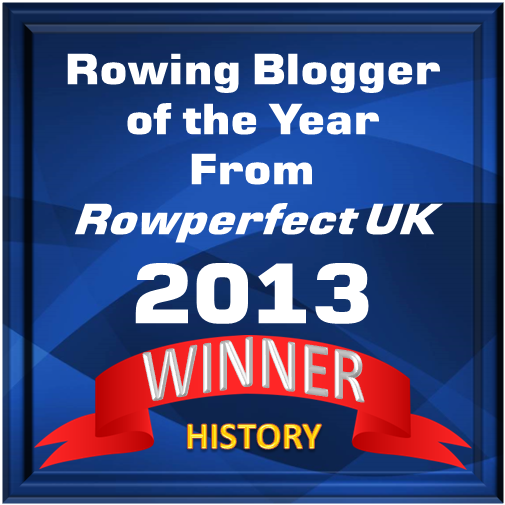 But, by the 1840s, sport rowing had become big news, and images of amateur and professional contests now appeared regularly in the illustrated press of the day, representing, in each case, an artist’s take on the scene as transformed into a woodcut by an engraver at the paper. These non-photographic pictures defined most of what a news-hungry public relied upon for sports news imagery for the next half-century. 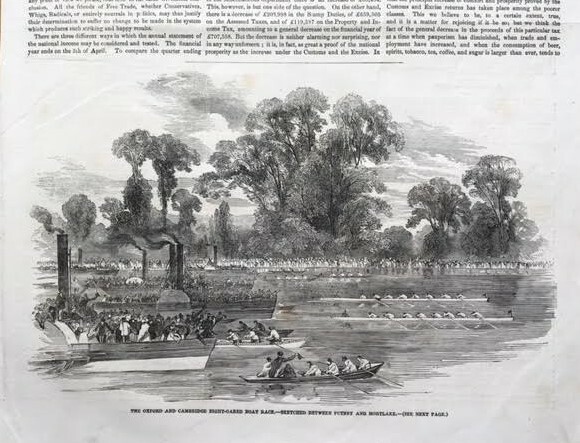 A woodcut in a paper showing the 1852 race between Oxford and Cambridge. It would be over a century before newspapers regularly segregated sports news into separate sections, but the emergence of sport as a subject of popular interest and fascination had already spawned a series of monthly sporting-specific publications in Britain and the U.S., including The Annals of Sporting and Fancy Gazette, first published in England in 1822. Unfortunately for our purposes, neither were these magazines profusely illustrated, nor did they devote much coverage to rowing. The first U.S. sporting publication to focus on rowing was The Aquatic Monthly and Nautical Review, which appeared in its first incarnation from 1872 until 1876, and briefly re-appeared in 1879 as Brentano’s Aquatic Monthly and Sporting Gazeteer. These issues contained the occasional woodcut image, but did not pretend to be an illustrated magazine devoted to sport. 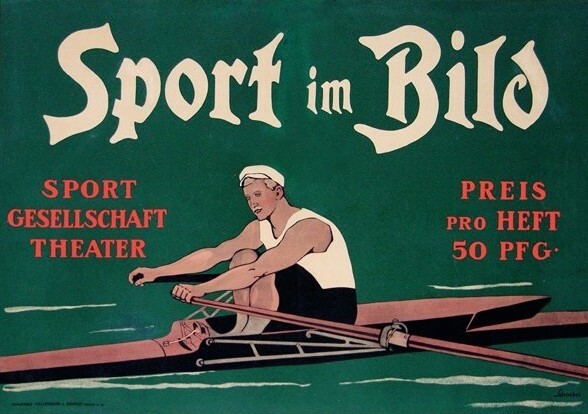 Americans have lived with the iconic Sports Illustrated weekly magazine for the last sixty-odd years, but the earliest such publication – preceding “SI” by sixty years – may have been Sport im Bild (Sport in Picture), which was first published in Germany in 1895. The end of the 19th century saw the transition in news publications from woodcut illustrations to half-tone photography, and the initial results – grainy, blurry monochromatic prints that could not capture quick action – were not pretty. But, although (and perhaps because) the photographic illustrations were just beginning their slow journey toward the sharp high-resolution images we enjoy today, the publishers of Sport im Bild decided to utilize a dependable and eye-catching old technology to launch their new product; in order to advertise the arrival of their innovative publication with a big splash, they turned to the same medium – the colorful and large format lithographic art poster – that Toulouse-Lautrec was using with great effect to introduce subjects like Jane Avril and the Folies Bergere to a world with an appetite for big print and bright colors. Thus, ironically, the birth of a visually struggling new pictorial sport magazine form was celebrated by the publication of one of the first “fine art” rowing posters. The primitive photography in the early years of Sport im Bild would impress no one, but when this striking portrait of a single sculler by Carl S. Schnebel (1874-1974) rolled off a German lithographic press in 1895, it not only introduced an era of illustrated sports news that continues unabated – and ever more enthralling – to this day, but also inaugurated a new format for rowing imagery – the iconographic rowing poster – which has blazed its own artful path of colorful glory ever since.